As I visit artists' studios and storage spaces, look through drawers and boxes that had not been opened for many years, peek into garages and attics, I am bursting with the joy of discovery. There are exquisite objects, lovingly and intelligently made, waiting to be found, admired, appreciated. In this series of blogs, Findings, I will focus on a single object from an artist's estate that particularly thrilled me. Some estates are clients of KunstWorks, some are not. I will start with the estate of Irving Guyer (1916-2012), brought to my attention by his daughter Leonie Guyer. 91-year old artist, whose eyesight was compromised by macular degeneration, living in the Sierra Foothills, made a series of paintings of tree trunks. 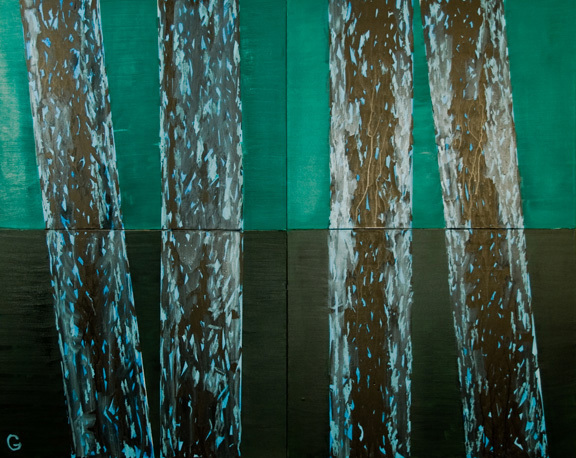 For Pinetum VI four smaller stretched canvases were connected to create a large canvas. The painting is both gigantic and intimate. The viewer is asked to see the trees but ignore the forest. There is light and darkness, luminosity and texture, order and imperfection, depth and veneer. Art as the "search for life with paint, hands and minds..." He does not mention eyes but refers to art-making as a purely tactile process--a powerful idea. Irving Guyer did find life. According to Leonie, he was still a charming bon vivant, smoking, drinking, and joking into his late age.